Our modest little series about some of the greatest, notorious, most important, even most useless, mayors of New York City. Other entrants in our mayoral survey can be found here. I’ve been very Manhattan-centric in this column, so it’s about time I introduce you to a man pivotal to Brooklyn’s history: George Hall, its very first mayor from its days as an independent city (1834-1898). The various townships of Kings County were growing at such rapid pace that the state officially bestowed a city charter to the town of Brooklyn in 1834. This would leave the county with one true city (Brooklyn) and five official remaining townships (Bushwick, Flatbush, Flatlands, Gravesend and New Utrecht) all of whom would eventually be conjoined in coming years through development and annexation. 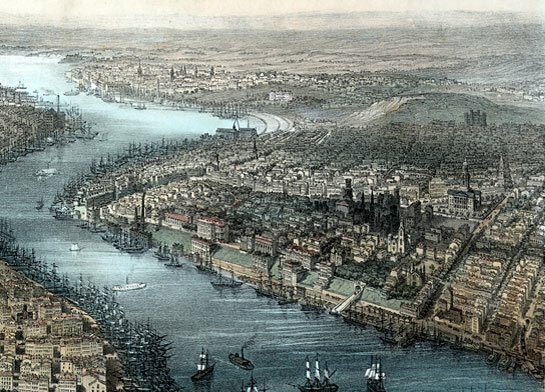 Later, a second city — Williamburgh — briefly competed for dominance, but it was no match for Brooklyn’s incredible growth and was absorbed in 1850s (hurling its dangling ‘h’ into the East River forever). By 1896, Brooklyn would come to mean everything within the boundaries of Kings County, just in time for its consolidation with the city of New York just two years later. That’s the history of Brooklyn in a nutshell. But that first year, 1834, heaped huge pressures on the growing new city, as influential landowners (such as the Pierreponts) raced to reshape the surrounding area to attract residents and new businesses. And the man planted in the driver’s seat, appointed by the city’s municipal charter by Common Council, was George Hall. Hall was a self-made tradesman, borne of Irish immigrants in Flatbush, a painter and glazier (glass seller) whose successes in the rapidly growing city made him a natural candidate for elected office, first as a ward aldermen then at last as the first mayor. 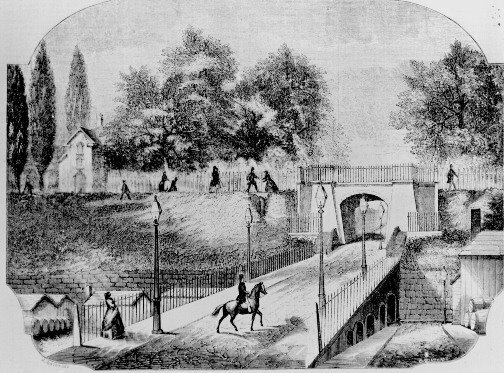 In 1834, Brooklyn had 20,000 residents and few paved roads outside of its city center (around Fulton Ferry). “There were, within the city, two banks, two insurance companies, one savings bank, fifteen churches and three public school,” Hall later described the scene. “Sixteen of its streets are lighted with public lamps.” Hall brought omnibuses to the city and passed measures to improve the water supply. Working with city leaders, he also purchased a site that would become the future home of Brooklyn City Hall. Hall was not merely concerned with the physical growth of young Brooklyn. Mindful of the intersection of commerce and morality, the tee-totalling Hall cracked down on “unlicensed rum shops” and reduced that awkward but somewhat common method of street-cleaning — releasing pigs into the street. Over twenty years later, as the city of Brooklyn expanded to consolidate with Williamsburg, city residents turned to Hall again, electing him for a two-year term in 1855-56. Below: Brooklyn in 1851. See if you can find where the picture above might fit in with the city as depicted below! Crisis came to Brooklyn during his tenure with a massive cholera outbreak, which nearly sent Hall himself to his grave. He lived the remainder of his life on 37 Livingston Street. One of Brooklyn’s most respected men, when Hall finally died in 1868, Henry Ward Beecher rose to give a rousing eulogy to thousands of mourners who filled the streets of Brooklyn Heights. Unfortunately, I couldn’t find any portraits of George to put in the blog today; however I believe you can find one if you visit the Brooklyn Historical Society. Aafter you’re visiting them, you can take a walk to Hall Street in Fort Greene, which is named after him.